Fishermen are worried about an offshore wind farm proposed 30 miles out in the Atlantic from Montauk, NY, the largest fishing port in the state. They say those wind turbines – and many others that have been proposed – will impact the livelihood of fishermen in New York and New England. “We have this little patch that’s sustained by myself and a few other boats out of Montauk and a couple of guys from Connecticut also fish down here,” Scola said. Scola – like many fishermen – is concerned about state and federal regulations. But his big concern is the prospect of hundreds, and perhaps even thousands, of giant wind turbines spread out in the New York Bight, an area along the Atlantic Coast that extends from southern New Jersey to Montauk Point. It’s one of the most productive fishing grounds on the Eastern Seaboard. “To me, building windfarms here, it’s like building them on the cornfields or the soyfields in the Midwest,” he said. Scola belongs to the Long Island Commercial Fishing Association, which is run by Bonnie Brady, the wife of a longtime Montauk fisherman. She’s an outspoken critic of the windfarms. 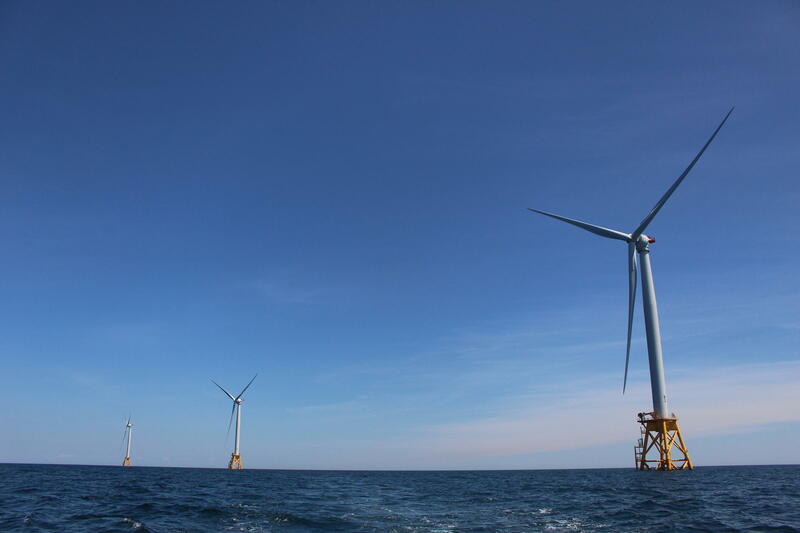 Deepwater Wind's project just off Block Island, RI is the first offshore wind farm in the United States. Providence-based Deepwater Wind, which operates a five-turbine windfarm off of Rhode Island, is proposing a 15-turbine installation called the South Fork Windfarm off Long Island. Deepwater also plans a 15-turbine installation off of Maryland, another windfarm off the coast of New Jersey, and one to be located 12 miles south of Martha’s Vineyard. “It’s not just us in New York. It’s all down the Seaboard. They want projects from Maine all the way down to South Carolina,” Brady said. These windfarms, Brady argues, will affect commercial fishing all up and down the Atlantic coast. Matzat said NYSERDA’s been studying the impact offshore wind development has had on commercial fishing in Europe where turbines have been a fact on the seafloor for 20 years, and off Rhode Island where construction of the Block Island Windfarm, the first offshore wind development in the U.S., was completed a year ago. “We want to understand where they fish, how they fish, trends they’ve seen over time, so that we can understand where best offshore windfarms could be located that’ll have the minimal impact on fishing, and then further, on top of that, how we can best design the windfarms within those areas to make it the easiest for fishermen to fish within them,” he said. But he added that he believes offshore windfarms and commercial fishing can coexist. The president of the Rhode Island Fishermen’s Alliance says that so far there are no measurable effects on his members’ catches off of Block Island. But a spokesperson for Deepwater Wind confirms that more than a dozen Rhode Island fishermen were compensated for interruptions in their work during construction of the turbine. The Fishermen’s Alliance is also calling for further study of the long-term impact of the electromagnetic waves emanating from underwater cables. The cable connecting the Block Island Windfarm to the mainland forced a fish company in the Narragansett area to relocate. And concrete mats placed over the cable to protect it have snagged and destroyed fishing nets, prompting more requests from commercial fishermen for compensation. This report comes from the New England News Collaborative, eight public media companies coming together to tell the story of a changing region, with support from the Corporation for Public Broadcasting. New Jersey's Governor-elect Phil Murphy has vowed to "immediately" bring his state back into the Regional Greenhouse Gas Initiative, or RGGI. It’s a move that could strengthen the pollution-fighting partnership. Governor Dannel Malloy signed a bill Tuesday that could change the way Connecticut's only nuclear power plant sells its energy.